Kentucky Attorney General Andy Beshear is laying out his priorities for the current legislative session. They include creating a fund for opioid lawsuit settlements to fight substance abuse, mandatory human trafficking education for truck drivers, allowing the Office of the Attorney General to petition the Supreme Court for multi-county grand juries and creating audits for utility companies before rate hikes are approved. Beshear said that as settlements begin to come in from his lawsuits against opioid manufacturers and distributors, there needs to be a mechanism to quickly disperse the money to help with the opioid crisis. “This measure would create not just a moral but a legal obligation for every single dollar that we recover in these opioid lawsuits to be spent addressing the epidemic,” Beshear said. House Bill 44, sponsored by Dennis Keene, a Democrat from Wilder, would create a committee that would decide how to spend the money, instead of waiting for the next budgeting process in the legislature. Representatives Angie Hattan, a Democrat from Whitesburg and Chris Harris, a Democrat from Forest Hills, are introducing House Bill 16, which would require the Public Service Commission to audit a utility company before a rate hike is approved. “If you’re going to give our utilities monopolies, which they have to provide power or gas or water, they have to be able to provide those basic needs at a price that all of our families can afford,” Beshear said. The bill would also require regular audits, and the Public Service Commission would be allowed to consider the affordability of the rate hikes in their approval, though “affordability” hasn’t been defined. House Bill 162 would require any Kentuckian getting a commercial driver’s license – typically truck drivers – to watch a short video on recognizing and reporting human trafficking. This bill is sponsored by Representative Ruth Ann Palumbo, a Democrat from Lexington, as well as a large group of bipartisan lawmakers. 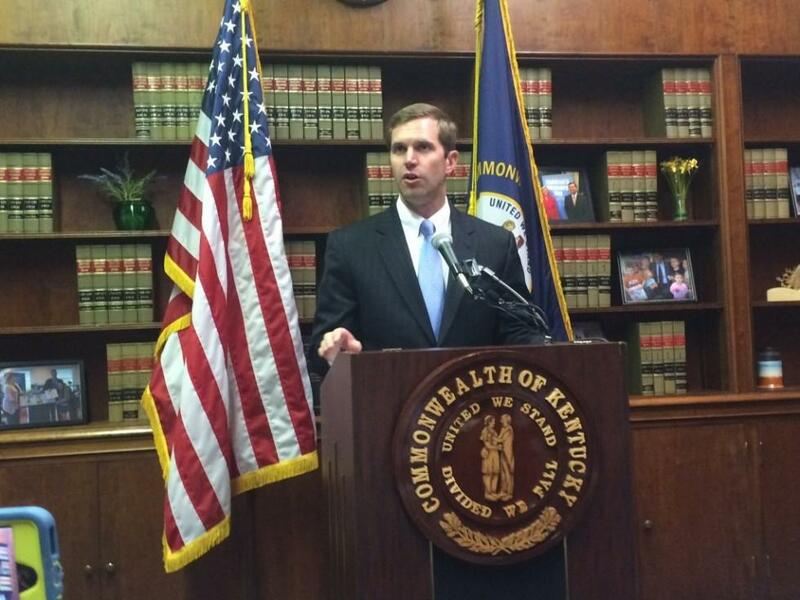 Beshear said his office is currently investigating 32 human trafficking cases. A similar bill was introduced in the past two sessions but was never heard. Beshear is also pushing for House Bill 65, which would allow the Kentucky Attorney General to petition the state Supreme Court for a statewide or multi-county grand jury. Sponsored by Jeff Donohue, a Democrat from Jefferson County, Beshear said this authority allowed the attorney general in Pennsylvania to investigate and subpoena eight Catholic dioceses to uncover how the churches had covered up sexual abuse of minors. Beshear’s move follows a report from the Courier Journal last year that found the Louisville Archdiocese paid more than $25 million in the early 2000s to 240 alleged victims who said they were sexually abused by priests and other people working in the church. Beshear also said he’s calling on the legislature to expand sports betting, including online poker to help bring in $550 million in revenue to pay for the Kentucky public pension system. “It’s time that we stepped up and were able to provide a dedicated revenue stream to our pension system, while at the same time not raising taxes on any single Kentuckian,” Beshear said. “I have been overwhelmed by the support I received during this campaign, but this decision will hopefully give another qualified candidate the opportunity to run their campaign as it should be run,” Westerfield said. Making a direct appeal to blue-collar workers, longtime legislator Rocky Adkins portrayed himself Thursday as the Democrat best able to win back support in rural Kentucky as the former college basketball player officially filed to run for governor this year. Despite spending more than three decades in the Kentucky legislature, Adkins acknowledged that he's viewed by some as an underdog candidate. The May Democratic primary includes two other candidates who have won statewide races. A former University of Louisville football player and lawyer for U.S. Senate Majority Leader Mitch McConnell has filed to run for attorney general in Kentucky, setting up a primary with a powerful state senator. Daniel Cameron filed paperwork Tuesday to seek the Republican nomination for attorney general. He is the second Republican to enter the race, joining Whitney Westerfield, a former prosecutor who is now chairman of the state Senate Judiciary Committee. No Democrats have filed for the seat yet, but former state House Speaker Greg Stumbo has said he plans to run. Democrat Attorney General Andy Beshear is not seeking re-election and is running for governor instead.